but please do read on and keep coming back because this campaign is moving very quickly! New content added most days. It is probably time for you guys to move over to the fantastic new website created by our sticker designer @missyredboots Judith Broug. for the latest news & to learn what to do if you find a dog in distress. For one thing, I’m overseas at the moment and for some reason I can no longer alter this blog from Portugal... And another, we get much more space on the new website and gorgeous design! Do please keep coming back to this blog though, now we’ve been introduced! 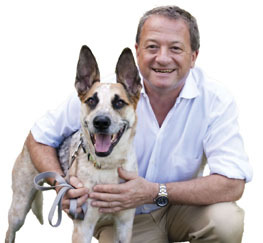 "I can still recall as a newly qualified vet seeing my first case of heat stroke in a dog that had been left in a car. The dog died, everyone involved was devastated, and yet several decades on these situations continue to occur. They are completely preventable, and as usual Dogs Today takes the lead in helping to stamp out these tragedies. Well done DT and I hope this campaign is 100% successful"
“This issue needs constant pressure to remind all owners and Dogs Today is the perfect voice to shout it loud, as ever. It's so easy to get caught out in British weather...what starts out as a cool day can suddenly turn fatal for a dog left in a car in the sun even with a window left a little open. But I think all owners need a sticker on the inside of the car where they can see it as they get out to remind them too, because I'm sure that only sadist would deliberately leave their dog to bake. All the terrible cases where dogs get so distressed or die seem to be due to negligence due to forgetfulness, or a momentary simple lack of forethought by otherwise good owners. They too need protection from their own failings... how terrible it must feel to live with the fact that one's own moment of negligence caused the death of one's own dog. "If there ever was a campaign that required every one in Dogdom to come together and act as one than this ‘Don't Cook Your Dog’ campaign has to be it. “Together we can prevent further suffering of our faithful canine chums, by preventing mindless and thoughtless acts occurring. Shoulder to shoulder, we must all stand together to make a difference and prevent such needless suffering." "If you cannot stand the heat, neither can your pet. THINK! I am delighted to be associated with Dogs Today campaign. " "As patron of a dog rescue charity, it's a subject that’s very close to my heart. I’m pleased to be able to offer my support to the Dogs Today ‘Don’t Cook Your Dog’ campaign. Every year in the UK, too many dogs die in hot cars – and as owners we must take responsibility. We all know dogs should never be left alone in cars, let alone hot cars, so let’s put a stop to this now. If you’re planning a day out with your dog, think carefully about what you are going to do when you arrive, and if it’s not dog friendly, it’s a no go with your four legged friend". Last night we needed to raise the substantial funds for a 100,000 sticker reprint to hit the exciting supermarket distribution deadline - not an easy thing made slightly more complex by me being on a family holiday in Portugal! It was as amazing as it was inspiring the reaction this 11th hour appeal got. some folks either working very late or very early! Isn't it fantastic that we are able to get the stickers into the hands of normal shoppers - the very people who may not yet have heard of this campaign. Well done too that very large PR company working for free that got the supermarket deal and Judith Broug for the quick redesign to incorporate the new list of supporters. And just well done everyone for helping and for my family for putting up with me working on holiday! “Dogs Today is, as usual, fighting for a better life for dogs. Surely nothing could be worse for a dog than to be trapped in a virtual oven - it would literally boil. I’m delighted to lend my support to the Don’t Cook your Dog campaign – it’s something that has always upset me, even as a child I remember worrying about dogs left alone in cars in the summer. 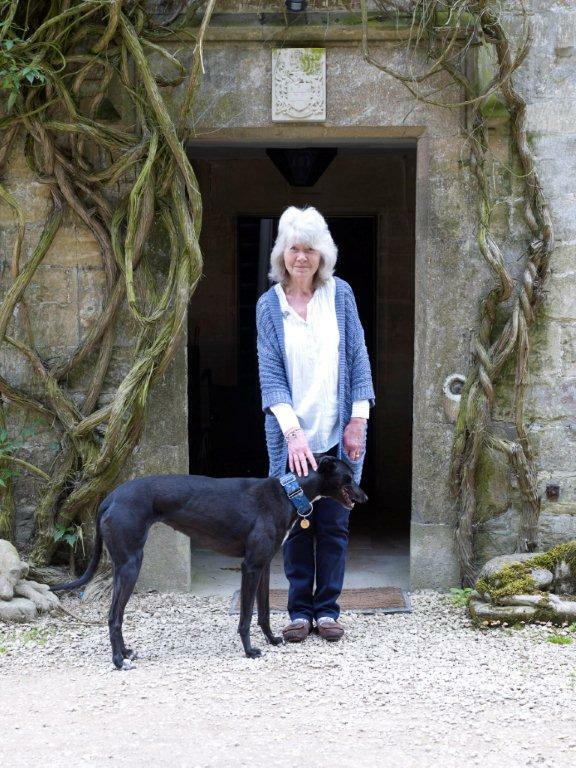 I believe offenders should be dealt with most severely to reflect the seriousness of the crime.” Jilly Cooper. ... this is really moving so incredibly fast thanks to a team of fantastic people! The first 50,000 stickers have landed! And we already need to order 100,000 more! The vast majority of the 100,000 stickers will be distributed free of charge by a VERY major national supermarket chain (identity embargoed!) who has agreed to support the campaign in 314 stores. It is a massive opportunity to reach the general public in a totally new way and we need to press print in the next 24 hours to meet the supermarket's launch deadline. Would your company like to be associated with this hugely significant campaign? Would be fantastic to show altruism and unity in response to this issue. 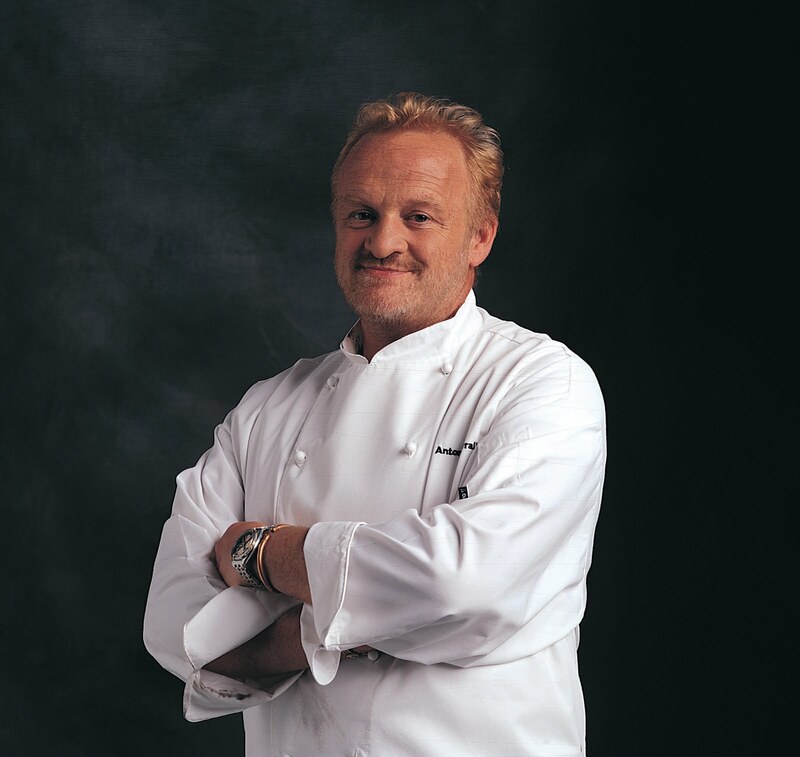 Two huge things happened yesterday - as hinted above a VERY major retailer came on board and a Celeb chef, too! Both still embargoed, but thrilling times indeed! Thank you very much major altruistic PR company working Pro-Bono for negotiating both of these two significant breakthroughs! (Why not become a moving poster while you shop with this bag? You must have heard about two police dogs who died in a car last Sunday morning. It has made many dog lovers livid. The fact that another dog in this same man's care had apparently died the same terrible way a few years ago has made normally law abiding dog owners incandescent with rage. That morning on Twitter we were all sharing our feelings of despair and disgust about how lessons have still not been learned. That some people still imagine that cranking the window down an inch will somehow prevent these atrocities. How do you get the message over that it is NEVER acceptable to leave your dog in a car on a warm day? And then there was a flash of inspiration. Many years ago the RSPCA did a demo of how hot a Volvo estate gets even with the tailgate up and all the windows down. They proved that within a very short period a dog actually starts cooking. And this led to the idea that a TV chef would really help get this terrible message across to people. Maybe repeat the RSPCA experiment with a chunk of raw meat and see how long before it starts to cook and put a timeline on it. It amazes me how many people still risk leaving their dogs in the car and think a window down will stop it happening. "It is unacceptable that every summer we are made aware of dogs that have experienced the most excruciating deaths by being left in hot cars. I share our supporters' distress and anger every time I hear of a dog who has suffered so unnecessarily. Despite repeated warnings, public outrage and very high profile media cases - the message clearly isn't getting through to all dog owners. 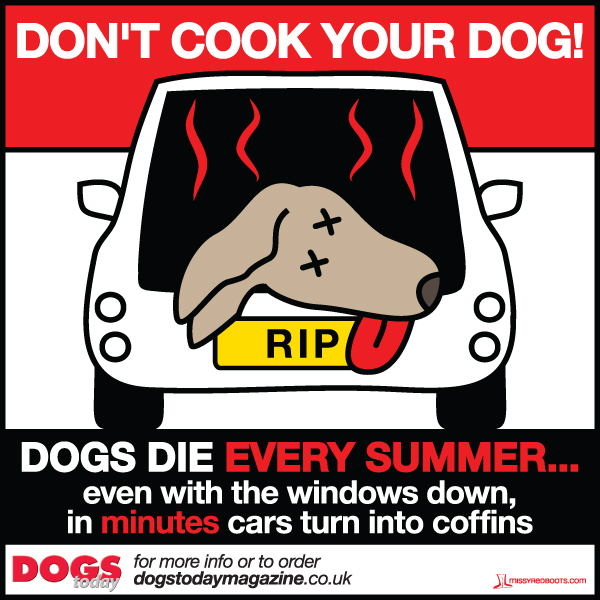 "Sometimes people need to be jolted into action and we're hopeful that Dogs Today's 'Don't cook your dog' campaign will force owners to view their cars as potential ovens on hot days. Temperatures can reach over 40 degrees in a car and this extreme heat can kill a dog within just twenty minutes. We need people to realise that opening a window a couple of inches is not an acceptable measure to protect a dog. Lets hope dog lovers join Dogs Trust in supporting the campaign so this time next year we're not faced with more tragic deaths of 'cooked dogs'." In addition the Digi Team are going to get active. “Wood Green, The Animals Charity fully supports the ‘Don’t Cook Your Dog Campaign’ as well as its parallel campaign ‘Dogs Die in Hot Cars’. During the warmer months a dog can die in a hot car in less than 20 minutes. We would remind people that under the Animal Welfare Act, pet owners have a legal duty to care for their animal and if they put their animal at risk, they could face prosecution. Please be responsible pet owners this summer and leave your pets at home with a frozen Kong!" "The Blue Cross warns dog owners every year about the dangers of leaving their pet in a car on warm days, yet tragic incidents continue to happen. Cars act like greenhouses so the heat builds up very quickly and dogs begin to suffer within minutes. Vets see cases of pets with heat exhaustion far too often and we strongly support the 'Don't Cook Your Dog' campaign. Animals can struggle terribly in the heat so avoid taking dogs on long walks and never leave them in the car, even if you have the windows open. If you see a dog left in a car on a hot day and cannot locate their owner, seek advice from the police." 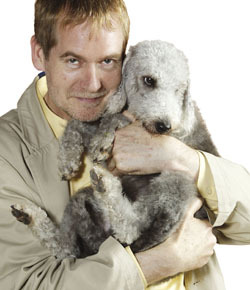 "The Kennel Club welcomes the ‘Don’t Cook Your Dog’ campaign and is very pleased to support it. Despite ongoing educational campaigns from many dog related bodies – including the Kennel Club – some owners still believe that their dog is safe left in the car with a few inches of window open and a bowl of water. Owners need to be extra vigilant when travelling with their dogs even in warm weather as it doesn’t have to be particularly hot for dogs to suffer from heatstroke in a vehicle. We sincerely hope that by everyone lending their support to one campaign we can put a stop to the tragic cases of dogs dying in hot cars that we hear of every year." Yes - it does keeps happening doesn't it. We've just heard that another dog has died - how many die without it ever getting into the press? Here is an extract from the story published by This is Wiltshire. In Chippenham a Yorkshire Terrier was left in a Ford Mondeo parked in the Iceland car park on Saturday afternoon. An employee at a local shop, who didn’t want to be named, said: “A passer by went over and put his hand through the window to open the door but it was too late by then. Police were called and spoke to the owner, who lives in the Nursteed area of Devizes. An RSPCA spokeswoman said: “All too often, owners make the mistake of thinking that it is sufficient to leave a bowl of water or a window open for their pet but this is not enough to protect your pet from heatstroke. It's a terrible way to die. Let's stop it happening. I think cases are usually under-reported - we normally only hear if it's a policeman involved. It's only since awareness has been raised that recent cases have been hitting the nationals? Only today we hear that a staggering 500 children have died in hot cars! How rarely has that been reported? Click here to see the full story. I am indebted to Kate Price, owner of the famous Olive the Pug, for undertaking this experiment. On back shelf of car in direct sun, all four windows open. 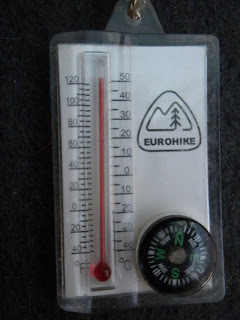 It only took a few mins to reach over 50 degrees Centigrade. On Victoria Stilwell's facebook page someone talking about our campaign mentioned that their kids have baked cookies on the dashboard... says it all really. And it's not just cars that are death traps in hot weather, news just in of a Golden Retriever tragedy: ‎"It was 4pm, so absolutely not the hottest part of the day - prob about 25 C - but humid. Ruby was only in the wheat field a short time hunting but came out panting very heavily and plonked herself down on the grass in the shade. Owner put her on the lead to walk her back and she collapsed. Rushed to the vet who dx'd heat stroke. She came home the next day but was very poorly. Brightened a little after two days then took turn for the worse and had to be PTS." Please be very careful exercising dogs on hot days, especially dogs with high prey drives who may push themselves too far. The owners of Ruby are totally devastated but still wanted their story told to hopefully prevent other deaths. Here's the sticker we've produced, thank you so much to @missyredboots Judith Broug for all her hard work designing this so quickly and putting up with my million or so changes of wording. The campaign has really taken off with versions being adapted for many different countries too! We are delighted to announce that one of Britian's biggest PR agencies has agreed to work on the campaign pro bono (or maybe Pro Bonio!). One of the early ideas is for a doggie happening in London next week to launch the sticker campaign. A doggie flash mob? Would you take part? Any other bright ideas very clever doggie folk? Anyone able to get a TV chef on board with this campaign? Thank you so much for Stephen Fry for joining in the campaign with a spectacular retweet. Stickers and posters are free, we only ask for p and p which you can now pay by worldpay. We can take orders for UK, Europe and non EU overseas from 1 to 500 stickers*. Please note that the first price bracket is £5 for up to 15 stickers. It's uneconomic to take a credit card booking for less than this amount and it cost more than £1,500 to bring thestickers to this country so please note this is just a contribution to their transit cost. If you only want one sticker please just send us a large SAE and we'll post you one - but why not take the 15 and give them to friends and family! will also be sent a FREE copy of our magazine as a thank you! If you'd like to print your own in bulk and want us to change the wording to a different language contact Rachael@dogstodaymagazine.co.uk - we want this campaign to go international, we want this to help as many dogs as possible. Please order or download your free posters now! While we wait for actual stickers to be delivered we have lovely A3 posters we can send you or an A4 poster you can download at home and print out. It would be fantastic if you can get these up in pet shops, vets, groomers, libraries, supermarkets etc. If you can't download from the click here button for any reason email: "poster" to rachael@dogstodaymagazine.co.uk and she'll send you a pdf! Our A3 printed posters have now arrived! We send you 10 in an A3 posting tube. Again buy via this link Click here or phone during office hours to use a card 01276 858880 for any of the items. Even though the office is only manned Mon-Friday, 9am till 5.30pm you will find me and others from the campaign on twitter and facebook outside these hours! Do please join us there as there is so much you can do RTing the message of the day or sharing this link on your facebook account. Could you link to this page from your website to show you support the campaign? We now have a button - either Click here or email rachael@dogstodaymagazine.co.uk if you'd like to be sent the gif and the weblink address - put "button" in the subject please! I was on ITV Daybreak's sofa last Wednesday talking about this issue hopefully puncturing the myth that dropping your window while you nip to the shops would save your dogs life. Here's the clip from Wednesday's ITV Daybreak if you missed it. Also - before you go please do check out this link... we are desperate to find a London foster home for Rosie - do click to read more - her homeless OAP owner was sleeping in her car with her dogs as she didn't want to give them up - the council halfway house wasn't dog friendly. You'll also get a heartwarming yet sad update about Milo the other foster dog... and just generally if you love dogs, just give it a read - you may know someone who is dog-less for eth summer who could be a foster mum or dad! Thank you to Karen Wild for recording this and putting it on You Tube, really helpful! Dogs Today, 4 Bonseys Lane, Chobham, Surrey, GU24 8JJ. If you are interested in bulk distribution ie more than 1,000 stickers - perhaps you are a retailer, petfood manufacturer or a charity for example or you have another amazing idea... please contact beverley@dogstodaymagazine.co.uk and put "Bulk distribution" in the subject line. Include your name, address and a daytime telephone number and state clearly how many stickers you would like and either a SAE or a cheque for the postage or phone us 01276 858880 during office hours. We're behind you 100%. Let us know if there's anything we can do to help, and where we can buy car stickers! I would definatley put a sticker in my care about dogs being left in cars, what makes it worse is the fact that this guy had let it happen once before, the police should know better, this is disgusting ! Excellent idea. I would also definitely put a sticker in my car and would hand them out too ! ALL dog owners know the dangers and consequences, there is NO excuse. Think the Met Police Dog Handling Section should be first to display !! We will support you 100% - we will even stock them in the shop if they are a for sale item! Absolutely I'd display stickers in my friend's car (I don't have one), and I'd hand them out to anyone and everyone! Posters could be made to put in shop windows, pubs and schools too. I would definitely support it, and would ask local vet clinics and pet shops if they would be willing to distribute the stickers. Great idea for the sticker. Would definitely have one in my car . . I would definitely put a sticker in my car. I used to have one from the RSPCA which showed a (cartoon) dog in a hot car with the words:dogs die in hot cars"
15 Minutes is all it takes." I also did some for the Dog Training School where I assist (changing the picture to their signature one) and we hand these out periodically. For my own car I changed it to the head of one of my own hounds and stuck it to the inside of the back window using bluetac. I don't think that this officer has let this happen before Jo, it was another officer from Notts a few years ago. Yep i'd put one in my car and would gladly hand them out. How about some kind of colour change sticker? One that would go red at even the slightest hint of warm. I don't think dogs should be left in cars at all, ever but people do and will so anything to remind them not to do it on a hot day would be great. Ah no you're correct Jo, just seen it on another website! Of course - great idea Beverley & why not approach a few celebs - I'm sure one if them would be keen to help as so many of them have dogs. Yes, behind this 100% I'd buy stickers and also sell them at my puppy classes. You are right - this officer has been responsible for the death of another dog, same cause a few years ago. Something has to be done about this, we need to get the message across to all dog owners. It is sickening that this man has been responsible for the needless deaths of 3 dogs. We will definitely put stickers in our car. Fantastic idea & great design. Hope it all comes together; good luck on TV in the morning! I don't have a car but would give them out to friends who have cars and dogs. I suspect you may find yourself overwhelmed with orders! How could this man forget he had left his dogs in the car? I can't bear to think about it and part of me wishes I had never read or heard about this because it is so upsetting. I got up very early yesterday to take my dogs out, took them out briefly for a comfort break halfway through the day just for five minutes, and then we went out again late at night. My day was totally structured around the dogs' needs in such hot weather. I understand the officer in question tried to commit suicide shortly afterwards. I would want to do that too if I had been responsible for my dogs' deaths. He will have this on his mind for the rest of his life. As an added punishment he should be banned from keeping or caring for animals for life. Have added the image to the sidebar on our website (hope that's okay!) and will spread the word about the campaign. Beverley you are going to need a very large print run on these stickers, 1000s of people are going to want them. I would be 100% behind this too. I can't believe how this has happened to police dogs again. They should set a good example. Just wanted to add - good for you for not starting a witch hunt against the police officer responsible for this. Instead you are doing something positive. Stickers are a great idea!, I'd put one in my car. Where do we get them from. Perhaps get vets to pop them on the counter or give them out to customers. I definitely support this and hope you get the stickers printed in time for the July issue. People are generally aware of the dangers. You need to look at why they continue to take a risk. For a start dogs need to be admitted to more places to prevent them being left in cars. The design of the sticker is very effective. If you don't have a car stick it to your house window so you can still get the message out there. Clair makes a good point - even on overcast days the car can get very, very hot. Great work on the campaign so far, looking forward to putting the stickers on my site and chatting to you for my podcast, too! I would love to buy the car sticker! This is a great idea - even if some people don't care/realise how hot their cars get it will raise awareness and passers-by will call for help if they see a dog in a car. I especially like the idea of the stickers being heat-sensitive. Have you contacted @RCVSTrust to see if they want to get the message out to their members and maybe help distribute the stickers to vets? There are other RCVS names on Twitter, and I'm not sure which will be most appropriate. Maybe @wearefordogs could help with the finances and advertising if they are asked? Excellent move - and might I say, having a car with tinted glass, this is the best colour combo and design I have seen of the few around that will show on my windows - well done Dogs Today ! Louise Bishop made a good point - more places need to admit dogs. My sticker, which I have had on my car for a couple of years now, attracts attention as it shows my own dog's breed, but the more of these types of warnings put on cars the better. You could leave all the windows open on a hot day and still the poor dog could die of heatstroke. I have been at a dog show where they had to smash the car window and drag the poor dog out - this despite numerous announcements during the day! Some people are just so awful and don't deserve to own these beautiful creatures.. Dogs sticker is a great idea. Its a shame we need to but as those who should know better don't get it we need to remind EVERYONE. While this is so sad and an unimaginably distressing way for an animals to die, it will also cause great issue with any rescue or retrievals that need the back up assistance of the Police - what right have they got to tell cruel people how to treat their animals when they can't look after them either. The RSPCA produced a leaflet called "Dogs Die In Hot Cars" a few years ago and it had a built in thermometer strip on it, ranging from 12ºc to 32ºc, showing the effects of temperature on your pet (from discomfort at 24ºc up death may occur in minutes at 30ºc). I had a few of these which I used to hand to people if I saw their dog in their car - now I only have one left. 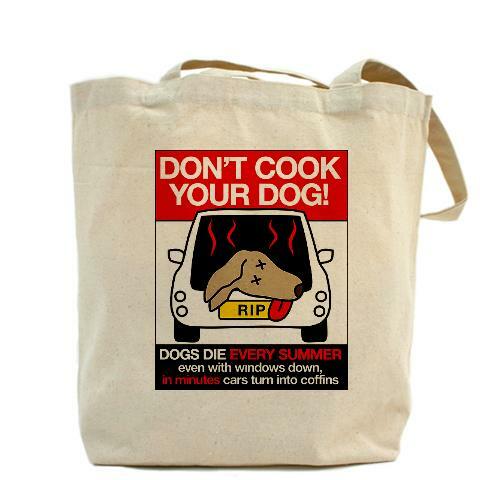 Maybe the RSPCA needs to produce them again (haven't seen them anywhere on their website) - having it in the car, as a reference, certainly makes it easier to decide if it is too hot for our dog. Further to my last comment - perhaps "Dogs Today" can include one of these temperature strips info cards as a free 'gift' in their next edition? Definitely need these stickers as just became a dog owner after 8 years of a break! It is a shame we live in a society that doesn't allow dogs everywhere we go as pets became such a big part of so many people's life! A technical question - are the stickers sticky on the right side so they can be stuck inside a car window but be read from the outside? I think all commercial centres should have a very large, obvious sign at the entrances to main entrances that state not to leave your dog in the car. I would also recommend a re-think on the word "cook" and "bake" as many people will not believe this and then not take it seriously. It sounds a bit..dunno, maybe too light hearted. cooking and baking are associated with fun, healthy attitudes. not this topic of cruelty. Its a serious topic, so I would think of a different word. Perhaps, "you wouldn't leave your child in the car wrapped up in a fur coat would you? so don't leave you dog there either" with the same picture. just a thought. I support this campaign wholeheartedly, enough to think of a way to really draw all people into awareness. I'll have one, too. No car, but I'll either get my mother-in-law to put it in hers, or put it in my window with the 'A dog is for life ..' sticker. This has got to stop. I would take part, distribute stickers locally etc. As for TV chefs, how about approaching Hugh F-W or Rick Stein, or try actors who have portrayed chefs, eg Alan Davies? Or perhaps Jimmy Doherty? "100% behind you i live in a seaside town and the public infuriate me how would they like it if i stuck them in car in tremendous heat they wouldnt"
I live in a seaside town too, one of very many that have a ban on dogs on the beach from May to October. Unfortunately this ban doesn't seem to be well publicised, & visitors arrive to spend an enjoyable day with the whole family, only to find the dog is not allowed! I'm not condoning them leaving their dogs in the car, but understand why this situation happens so much in seaside towns. I believe the wider issue of the dog unfriendly attitude of many businesses & local councils is a contributing factor to the problem, & one that also needs addressing, although this is not the correct place, as it would detract from all the good work Beverley is doing with this campaign. i don't have a car but what i would like to do with this image is print off a bunch of flyers and put them on people's windshields when i see a dog inside. just today i saw several and was thinking about this campaign and wishing i had something to write a message to the car/dog owner. I recently emailed Logan Botanical Gardens in Scotland to ask if it would be possible to bring our dog when we visit (Benmore Botanical Gardens in Argyll are VERY dog friendly) I received an email back telling me that while dogs were not permitted in the gardens they do have a shaded parking area so that we could leave him in the car! Needless to say we will not be visiting because we're not prepared to do this but how do we get the message across when this is an 'acceptable' response??? We are right behind this campaign and happy to promote greater awareness to all of our customers. This is a really worthwhile campaign! The thought of dogs shut up in red hot cars really distresses me. I'm just about to order some stickers, but have you thought about getting them on those screens you put across the car windscreen? I thought of it because I was wondering if I could get one made up into a cover for the back window of my van, I've usually got something up there in summer to help keep the sun out, it might as well be something useful! Totally behind the campaign 110%. However, I am a dog owner and I have to take my dog everywhere in all weathers, this being said, both sunroofs are left open as are windows, his cage is covered at the top, he has water and also a dog cage fan. He is never left more than half hour in any heat. And I alway's park in the best shade I can. Hi , fully support this, however must say recently had the Police dogs working with us in Staffordshire, all the vans were air-conditioned and when the engines were off the tailgates were open and they have sun shades. I think it shows a good example of how police dogs are looked after by some police forces. There is no excuse for mistreating animals even by the police. My husband's a driving instructor...I shall be ordering stickers for him to give to his students. Fantastic idea, I will make sure to put this information on my blog as well as asking other dog and car owners to consider displaying a sticker. In fact, I will ask anyone who owns a car to consider buying a sticker whether they have a dog or not! Last summer, I discovered a dog in a car. 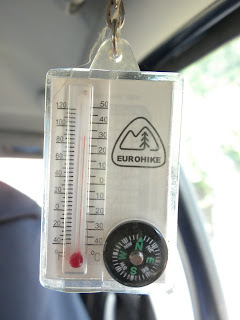 It was a cool day, and the car was in the shade, but it was still hot enough in there for the windows to be completely steamed up (they were not left open). The dog, a black lab, was barking non-stop, and fussing so much that she was causing the car to rock back and forth. I called the police and waited around until they came. The police eventually got the door open, and the dog was so happy to be out that she was jumping up on people and licking their faces. Shortly after she was let out, the owners came back. They had been at the park playing soccer. (Why they didn't bring the dog to the park with them, I have no idea.) They were completely surprised that the police were there, and didn't understand why they were given a $150 ticket ("But it's not hot out, and she had water..."). The cops gave them a stern lecture about leaving their dog alone in a car, ever, even on a cool day. They complained bitterly about the ticket, but didn't seem at all concerned that their dog could have died. I left with the impresion that they didn't understand that they had done anything wrong. Can we have one for kids? You have now been tweeted by Stephen Fry. Expect to get inundated with requests. People - please don't assume that everybody knows this information! I knew that hot cars could be dangerous for dogs, but I had NO IDEA that it only takes a few minutes for a dog to die from the heat. I have a dog and nobody told me this information. In the US, vets don't mention it, groomers don't mention it, fellow dog owners don't mention it. I usually don't leave my dog in the car for any more than a FEW minutes, but now that I know this, I won't run ANY errands with him in the car on a warm or hot day again. Do you have a contact for anyone who may be cooperating with your campaign in the US or would we just purchase stickers from you in the UK? We'd love to partner with charities or organisations in the States to get these stickers more widely available - but until we find someone who wants to take it on we're happy to post them to the US and have bulk rates set up for up to 500 on the website. When is it ok to leave a dog in the back seat? 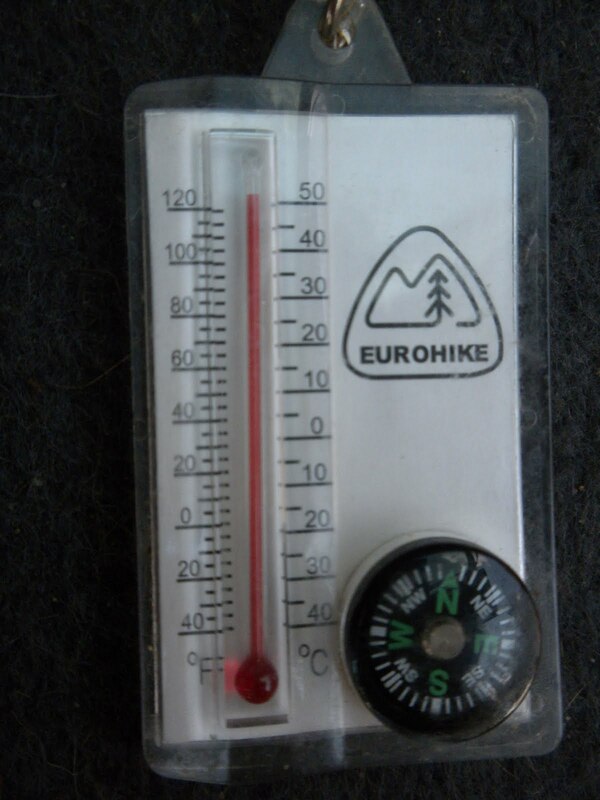 what temperatures are "safe" and "comfortable" for a dog? I am in Spring, Texas in the USA..near Houston. It can be hot here all year round. I love these stickers. I ordered them as I volunteer with a Siberian Husky rescue called Husly Haven. We are out at various adoption events and the Reliant Dog show. These will be great for us to hand out! Thanks for the work you do! Just wondering what people think to getting a mesh gate which you can lock so that the boot of the car can be left open. Would that benefit dogs that are left for a couple of minutes? I think that unfortunately some people think they are doing the safer thing leaving their dog in the car instead of taking them with them. If it's hot out, they might (wrongly) assume it's not fair on the dog to be 'out' in the heat but not realising it will get even hotter in the car. I think it's down to ignorance, far and above stupidity. All we can do is aim to educate - and as another poster has pointed out, many people don't tell you. I think it's core to get to those who interact with dog owners - pet stores (P@H are obviously huge in the UK, PetSmart in the US I think), vets, groomers, rescue organisations, kennels etc. Perhaps creating a particularly awareness week (for the UK, perhaps around Easter as it starts to get quite warm from then) might help give these organisations a regular annual occasion to campaign / hold events or talks at their locations, have sticker giveaways, could even do demos (without dogs, obviously!) in their car parks of how hot a car gets in minutes. 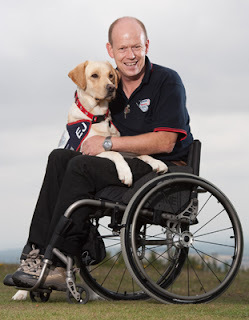 It needs advocacy from major groups and networks as well as us individual dog-owners to really have legs. Best of luck with everything Beverley and team, I really admire you for taking this one by the teeth. If the government have stopped people smoking so successfully in public places they could pass a law to say 'NO DOG SHOULD BE LEFT IN A CAR BY ITSELF' END OF the problem is they just don't care about animals,also the policeman should be sacked, he should have been sacked last time he left a dog to die in his car then this wouldn't have happened again.Vivienne Evans. This issue needs constant pressure to remind all owners and Dogs Today is the perfect voice to shout it loud, as ever. 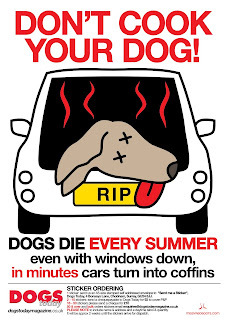 It's so easy to get caught out in British weather...what starts out as a cool day can suddenly turn fatal for a dog left in a car in the sun even with a window left a little open. But I think all owners need a sticker on the inside of the car where they can see it as they get out to remind them too, because I'm sure that only sadist would deliberately leave their dog to bake. All the terrible cases where dogs get so distressed or die seem to be due to negligence due to forgetfulness, or a momentary simple lack of forethought by otherwise good owners. They too need protection from their own failings... how terrible it must feel to live with the fact that one's own moment of negligence caused the death of one's own dog. I once acted as an expert witness in a case where a dog had apparently jumped into the back of his owner's car without him knowing. He went off to work and the dog baked to death, which he didn't find til he came back to his large estate car hours later. I found it hard to believe that a dog could jump in without the owner knowing, but as the case unfolded, the level of distress shown by the owner and descriptions of his dog's normally quiet behaviour were enough to convince the court, and also me, that this had indeed been a terrible accident. The dog of course, had still suffered horribly and died, and the owner still had to live the fact. Maybe a sticker on the inside and the outside might have prevented this tragedy too. Let's stick these things everywhere!! My stickers arrived yesterday - I ordered 15, as although it was only me that wanted one, I thought I would easily get rid of them all and since I have had your poster, several people have mentioned thay would like one. I only have 8 left now and if I still have them in 3 weeks (which I am sure I wont) I will be taking them up to kennels that I volunteer for and giving them out there. did a post on my blog on this very topic and then someone on twitter asked me to repost your blog - so i did! the more people spread the word the better! Dash the Dog Show already making a splash! Can you take Rosie and/or Milo? What would Agatha Christie make of it all?